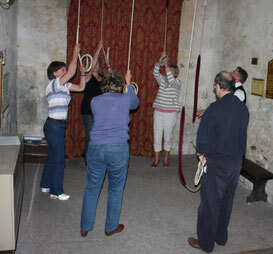 What is Bellringing all about? Bell ringing is good fun! Once you have learned the basic technique you will always be made welcome when you visit other towers. Once gained, bell ringing is a skill for life you'll never forget and can open up a lifetime of experiences and enjoyment. Ringing does not require any formal musical training, but a good sense of rhythm and a “musical ear” are helpful. The only mathematical ability you need is to be able to count. Ringing is more about technique than great physical strength but good co-ordination is important. Also, many ringing chambers, including ours, are accessed by staircases or steps and therefore it is necessary to be reasonably mobile. You do not have to be a church-goer to learn to ring. In most bell towers you can learn to ring from about the age of 11. The initial learning may take several weeks, but of course some learners progress more quickly than others. After this you can begin to ring with the rest of the band, although there is still a great deal more to learn. Most ringers practise once or twice a week and ring before or after church on Sunday. Here in Stoke Fleming we follow the traditional Devon style of "call change" ringing. The conductor calls different pairs of bells to exchange places in the sequence of striking. The obective is to make perfectly struck rhythmic music. 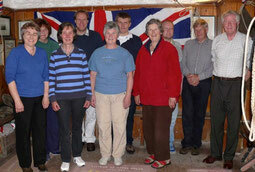 Visit the websites Discover Bellringing or the Central Council of Church Bellringers.